There are now 11 players left. With the elimination of one more player, we will redraw for seats at the final table. We are down to the final 17 players. There are now 25 players remaining. We are now down to 38 players in the $400 NLHE event. With 70 players remaining, the bubble has officially burst and all players are in the money! The blinds are about to be increased to 1000-2000 with a 200 ante. There are approximately 106 players remaining with top 70 paying. The 299 remaining players are now on a 10-minute break. When they return, the blinds will be increased to 400-800 with a 100 ante. 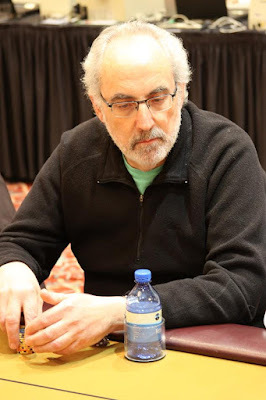 The $200 NLHE event is now on break at the Foxwoods Poker Classic. There were 692 entrants and the top 70 will finish in the money with first place receiving $28,756. There are approximately 416 players remaining. 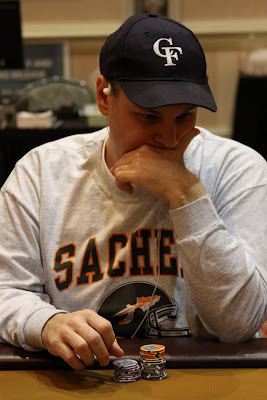 Tomorrow, Match 18th, at the Foxwoods Poker Classic, we have two new events starting. At 11am, the $400 NLHE event kicks off in the Grand Pequot Ballroom and at 1pm, the $400 HOSE event starts up in the main poker room. Don't forget that this Saturday, March 20th, the $1,500 NLHE event with 15,000 in starting chips and one hour levels starts up at 11am. On Thursday, March 25th, the $3,500 Championship event starts at noon. All players will start with 30,000 in chips and levels will be 75 minutes in length. 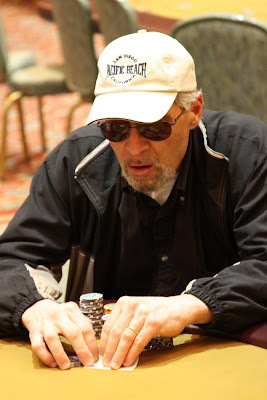 A total of 140 players entered the $400 Omaha High/Low event. There are still 140 players remaining and the final 15 players will finish in the money. 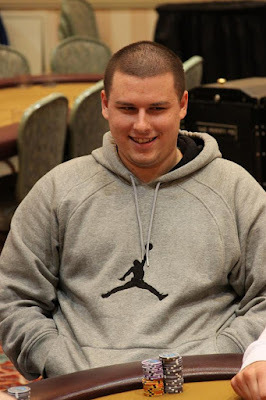 A total of 692 players entered the $200 NLHE event. There are 390 players remaining and the final 70 players will finish in the money. 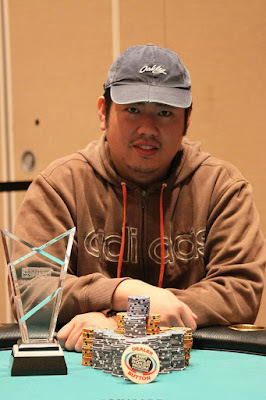 Victor Chu is crowned winner of the $400 NLHE event at the Foxwoods Poker Classic. He takes home $19,809, the trophy and the leather jacket! 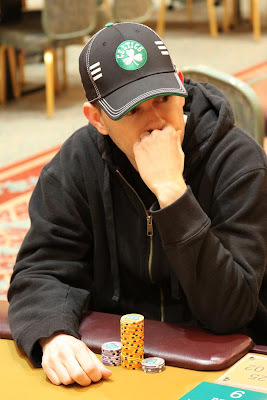 Just before the start of heads-up play, a deal was made and Jeremy Wing is officially your runner-up. 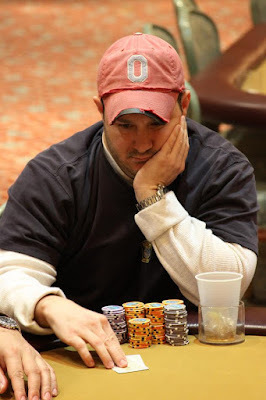 On a board reading [Ac][9h][7d][Ts][5d], Victor Chu bet 140K and Roger Fisette moved all in. Chu made the call and turned over [8s][6d] for the straight. Fisette mucked and Chu took the pot. Fisette has been eliminated in 3rd place. The board ran out [Qh][8s][6s][Jc][3d] and Chu took the pot. Leach is eliminated in 4th place. The case queen on the flop gave Lapido top pair but made Wing a set. 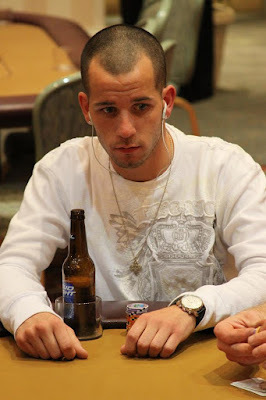 The turn was the [5h], giving Lapido a few more outs with the flush, but the river was the [5s]. Wing won the pot and doubled up through Lapido. Lapido was left with only 9K in chips. He was eliminated two hands later on his big blind. Pike was ahead, but the board ran out [Qs][8s][5s][8d][2h] and Lapido paired his five to make two pair and win the pot. Pike has been eliminated in 6th place. Fisette was dominated but took the pot when the board came [Kh][5d][3s][9h][Qh] and he paired his nine. 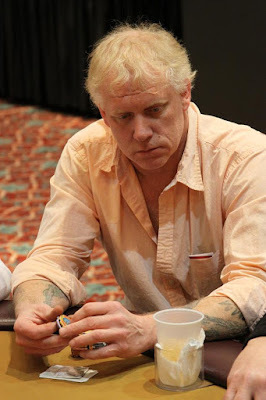 Hoglund is eliminated in 7th place. Procaccini had Lapido dominated until the board ran out [Ad][Jh][9c][2s][8c]. Lapido made two pair to take the pot and knock out Procaccini in 8th. 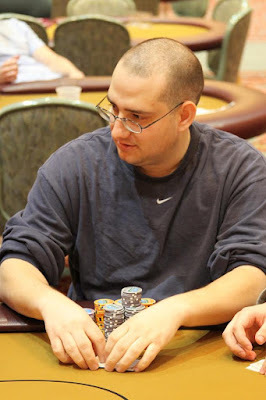 The board ran out [Kd][3s][2h][9h][Qh] and Fisette's aces held up to win the hand and knock out Leblanc in 9th place. The board ran out [Jc][Td][4d][4c][9s] and Procaccini paired his jack to win the pot and eliminate Cooperstein from the tournament.